After Jung Il Woo,and Lee HyunWoo's visit last month, Korean Drama addicts once again delighted to have another drama prince to the shore. Last Friday night, local organizer Jazzy Group bring home the most anticipated multi-talented Korean ranking-king to Malaysia, Lee Seung Gi. For those who are not familiar with him he is an entertainer who is famous for his boy-next-door charm in KBS variety show 2 Days and 1 Night and his witty humour in Strong Heart. Fulfilling the dream of many Airens (Lee Seunggi's fanclub name) in Malaysia, Tonight with Lee Seunggi is what people called a fun-packed fan meeting for his long-awaited fans who waited for so long for his visit. Held in Kenanga Wholesale City, the event started off exciting when he came out on stage singing his first song for the night, Age of Love before officially greets his overwhelming Airens. The MC asked him few questions and one of the most memorable one is when the MC asked him what do you think about Malaysian women to which he answered 'cantik' (in Malay, it means pretty, beautiful). The MC then asked about how he likes Malaysian delicacies and which is his favourite, he said that he likes nasik lemak the most. I was told that MYAiren fanclub prepared a special hi-tea for him when he mentioned that he wanted to eat nasik lemak during interview in local radio RedFM. Their hardwork in preparing food for their Prince is paid off when he really shows how happy and touched he is with the love received by fans. That, night he also prepare something special to the fans when he said he will say "I love you" in three language, in Chinese, Malay and English. They also aired top three K-dramas that Lee Seunggi starred in, My Girlfriend is Gumiho, King of 2 Hearts and Brilliant Legacy. During the kissing scene of the most favorite drama by fans, Brilliant Legacy, the venue echoed with the loudest scream a normal ears can take. By looking at the reaction of the fans, he asked "why the fans scream so loud, do you like it that much? I would like to do more kiss scene in the future.' Together, the Airens scream 'No' and 'Andwae'. He sure likes to tease his fans a lot. Malaysia Airen also prepare a special footage of Lee Seung Gi in conjunction to his first visit by showing numerous video support by fans. Eventhough he is a good actor, I know he wouldn't fake the smile and gratefulness in his eyes, when he said, he appreciate it a lot. He also said, eventhough he is in Malaysia, he doesn't feel that way because the support is overwhelming that he feels like he is in Korea. 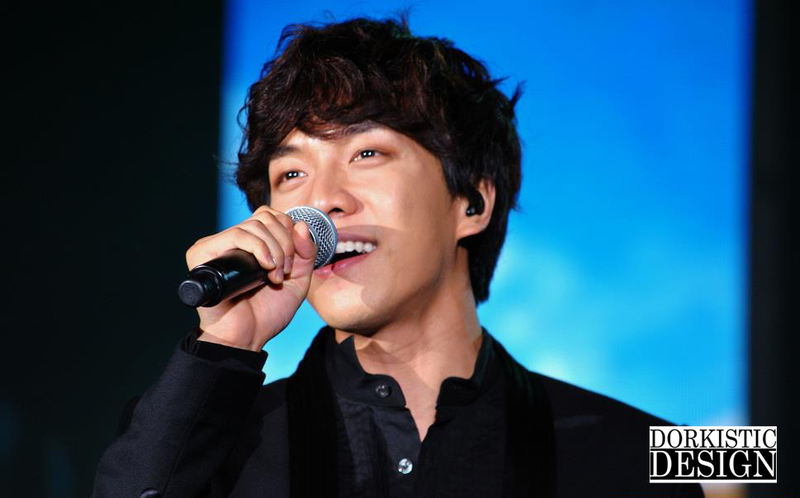 The game session took place after Lee Seunggi came out with two-toned black-and-white long sleeves shirt. Looking swag and friendly at the same time, he looks like he wanted to take over the stage with his MC-ing skills. The first game was the song-guessing game where he sing apart of the song and those luckily-picked 6 fans will have to run to the mic and sing the later part. Eventhough most of them seems to know very little Korean (and his songs), Lee Seunggi allowed fans to hum to the song instead of singing to it. The winner of this game entitled to have a hug from him in which I wonder the girl still alive or not when she went down, and a freshly-signed pillow-case with his printed face. He came back on stage with all-black t-shirt with black outer-shirt. Then he said to fans, "should I take off the button?" and of course a normal fangirl being will say yes and he said "no, 2 buttons only." Enough with teasing, he kicked off the stage once again with his second song of the night, Aren't We Friends followed by Will You Marry Me. From a sad ballad to a romantic one, he sure know how to captivate the hearts of fans and the audience. Rocking the stage with cheerful and hyped number, Smile Boy and Let's Go On A Vacation, the fans were no longer seated but jumping around instead. After the encore being chanted, he once again come back with his debut ballad, Because You Are My Girl, in which he sang his heart out. He said he has different feeling when he sing it here. He feel touched with the warmth he felt from the fans. (tsk tsk~). Closing the door with upbeat, rock-feel number, he ended it well with Slave and surely the hearts of the fans are fully content with the heartful event and meeting with their ever-loved prince. Not forgotten the awesome crew of MY Airens fanclub also prepared gifts to their prince which consist of Malaysian traditional kite in here we called it 'wau' and a cartoon sketch of his potrait. Moved by the gifts, he say he feel most thankful and welcome to those fans who came here today to spent time with him. MY Airen deserve every kudos in the world for giving warm welcome to the prince but also to all media oultets present by giving us a door-gift with their fanmade merchandise. Special thanks to MY Airen Fanclub~!! Thanks to Jazzy Groups for a chance to cover the event! I am so touching from beginning till the end of the showcase..Jazzy & Seung Gi make our dream comes true~ I tear out during the 1st song..it is REAL~He was with us here..In Malaysia..
- Tulis - thank you for the insight! Yes, indeed he is a gentleman to ask permission first before doing so. Greetings from Malaysia! Thank you for vising our site and have a great day!